Today I interviewed four incredible volunteer construction workers. I had heard from the men and realized it was time to share some of the faith motivations of women working on the build. I caught up with Erika Anderson while she was taking a break from leading a crew of volunteers installing shingles on the roof of her assigned house. Erika is a staff member of The Fuller Center Disaster Rebuilders program, who traveled with some colleagues from Orange, Texas. Unlike most of our Covenant Partners who build in a very specific geographic service area, our Disaster ReBuilders mission partner travels to respond to natural disasters in the United States. Established in Biloxi, Mississippi in response to hurricanes Katrina and Reta, most recently, they have been repairing homes that were flood damaged by hurricane Ike in September of 2008. Erika is an architect who graduated from the University of Minnesota and is attending a Church of the Nazarene congregation. She loves coming to the Fuller Center Legacy Builds because she actually gets to do some physical construction. Most often she spends her time doing the administrative work and planning construction projects. Echoing Orie Lehman’s comments about enjoying being around people with a common interest, faith and compassion she says, "I find people like me and the builds are like a family reunion." She followed up by observing, "We all have the same God." I asked her about her work with Disaster ReBuilders and she says she tends not to dwell on why God allows disasters to happen, but tends to see that a disaster "stirs things up, brings friends to a community and need and provides hope. When I have a bad day, I go visit the homeowners and I remember what our ministry is all about." Janet Lee is from Stone Mountain, Ga. but she works in her home town of Savannah, Ga. as a church administrator for The First African Baptist Church which is the oldest black church the North America, built by black slaves for black slaves and dates back to 1775. Recently, singer John Mellencamp was baptised in her congregation and the actor Louis Gossett, Jr. became a member. When I asked Janet what the most important faith statement is that results from a Fuller Center Legacy Build, she immediately thought about the Great Commission in the Bible where Jesus commands us to "make disciples and team up together." She says, "When that happens, the divide lessens." I asked her to explain further what she meant by the "divide." She said, "Ethnicity, culture and political differences disappear and we blend into one community which is what God intended. If we could coexist every day, differences would be forgotten and we would not be fighting over power, food or money." "God commands us to use our spiritual gifts, and we often do that, but a build like this requires us to use our spiritual gifts in a context that is beyond our comfort zone." Demonstrating this, she later told me that she prayed every step on the ladder as she carried new windows to a third story roof at the Greater Blessing repair project she was assigned to. Just up the street from Janet, I ran into Olivia Kilian who is a political science major in her junior year at Saint Mary’s College in Notre Dame, Ind. An avid cyclist, Olivia had first learned about The Fuller Center through our Bike Adventure effort. 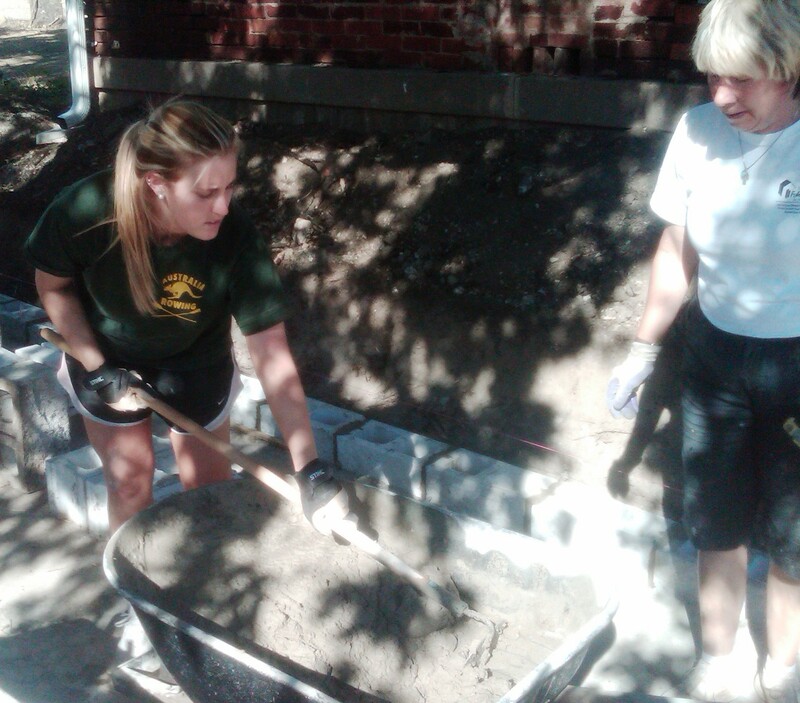 Olivia was learning how to mix mortar for a team that was replacing a badly needed retaining wall on one of the Greater Blessing repair projects in Fountain Square. 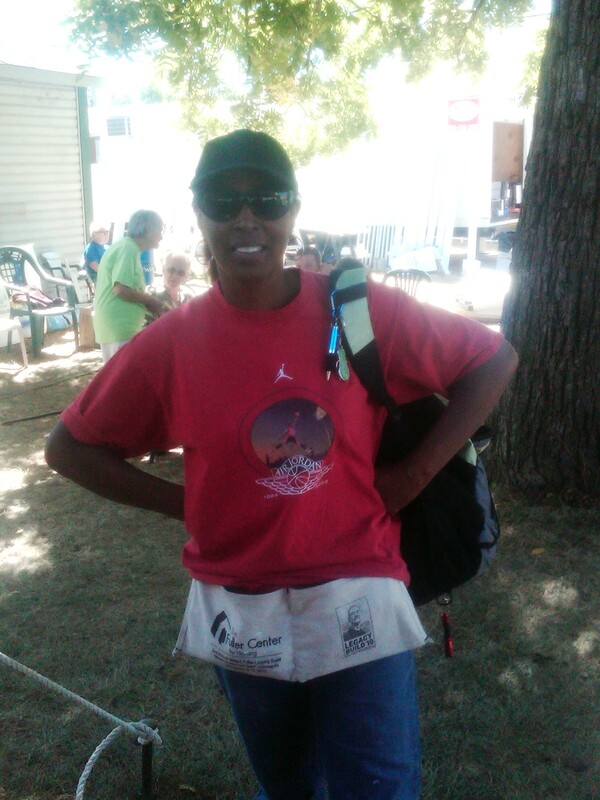 She said her motivation was "good work" and that the Fuller Center ministry is so "personal" and that she especially enjoyed working with the homeowner families. She shared with me that mission work had been a great emphasis at her Catholic college and at her home church near Saint Louis, Mo. which is the Holy Infant Parish. It must have been, because Olivia drove three hours to volunteer today! Having listened to our thoughtful and talented theologian volunteers on site, I felt I was missing an important piece of the story. 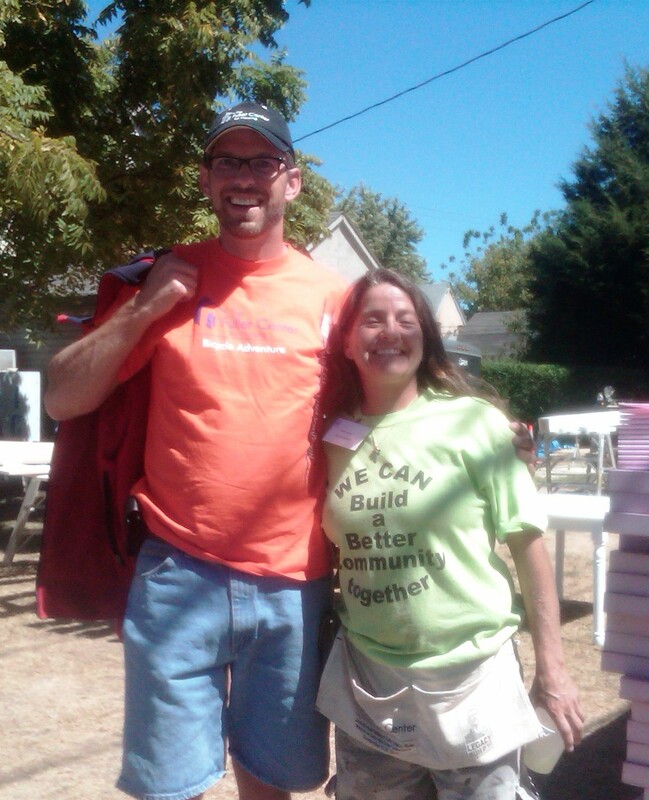 We have seen that our volunteers were truly motivated by faith and many had religiously come to builds for decades. 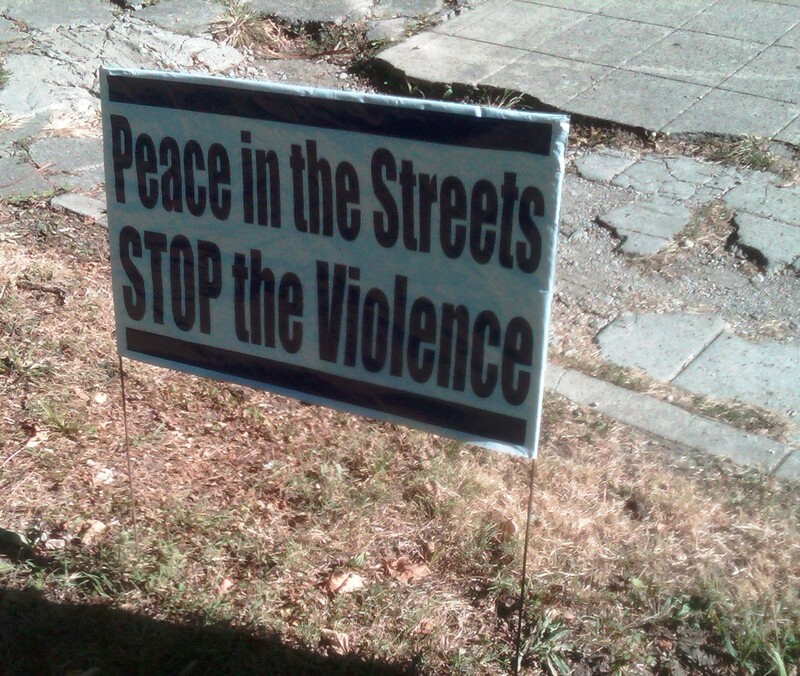 I walked down through the neighborhood and saw signs demanding peace. I saw a memorial for a young woman gunned down in September 2006 on the corner of Saint Paul and East Pleasant Run Parkway Drive. I couldn’t help but wonder what about our homeowners who had been living in poverty housing, rough and violent neighborhoods for just as long, praying for decades and hoping for change? So I went to visit homeowner and neighborhood organizer Marti Lamar to see if I could find out what her faith journey was like living in a deteriorating house in a dangerous community in decline. Marti grew up with a father who bought properties and then rented them out. She told me that when she was old enough to help her father with the properties, she not only learned how to repair homes, she would pack a 357 magnum pistol when she went to collect rent from delinquent tenants. She said she saw all kinds of horrible situations and while this made her tough as nails, perhaps this was the beginning of our faith foundations and her compassion for the community. She grew up in a house with a family that was not Christian. The dwelled in the darkness and she relished this in her big "haunted house" that she inherited from her parents when they passed away. She couldn’t keep the house up and she became scared as it had to be boarded up. She was living with no utilities and the city was trying to force her out of the house because it was worthy of being condemned. She said the community used to have a lot of children running around. Sadly, the parents were often engaging in substance abuse and the drug dealers took over and started having. violent turf battles. After several meaningless murders of her neighbors, wanting to help, several organizations (such as our partners at Southeast Neighborhood Development (SEND) and churches started to take interest in the community. Marti said before that, "Only the police, the dog catchers and the building inspectors posting notices of eviction ever came into our neighborhood." Having sat alone in her house reading her Bible over the years, it was a long painful journey. But she found hope in what she was reading. It sustained her and watching others wanting to become engaged with the community, she decided to get involved. One of her fondest memories of this journey, and perhaps the event that made her truly believe that some good was truly going to happen was when Jeff Cardwell and Chuck Vogt, Linda Fuller and the folks from SEND had a kickoff celebration last May. Marti said, "Within a week after your leadership marched down the block signing, "Oh When The Saints Go Marching In" the drug dealers started to move out. Marti says she doesn’t think she could have "truly understood God without having wrestled with the evil Devil." Hope comes from "sticking together, looking out for one another" and now she looks forward to helping her new neighbors integrate into the community. She told me, "I was never formally educated. When the organizers came to visit, I didn’t have a clue what a ‘liaison’ was." The Fuller Center for Housing truly has no greater liaison or theologian than Marti Lamar. Blessings, have a great evening and see you at morning devotions!